Black comedy. 1m/1f. 90 minutes. Jean-Francois is an agoraphobic. His sister, his last link with the outside world, has just died. Somehow, JF must summon the courage to fling open his garage door and walk outside. Jean-Francois is an agoraphobic, who is living out his life in a garage underneath an access ramp in Montreal. His beloved sister Sophie has just died. She had been his contact with the outside world and, now that she is gone, the future looks grim for JF. But suddenly a series of visitations begin happening - some miraculous, some upsetting. JF's sanctuary is invaded by his Cousin Alphonsinette and her miraculous invention; his battle-axe Aunt Zenaide, the famous industrial designer Raymond Loewy, his onetime girlfriend Lucy Cormier and the parish priest, Father Rocky. Hovering above them all is JF's guardian angel, his sister Sophie. She must furiously orchestrate her brother's emergence into the wider world, before she disappears forever into the ether. My sister and I really did learn how to write with our feet. It was 1964 and the recent, unexpected death of a president was weighing heavily on our minds. If Kennedy could be bumped off so easily, what horrors awaited two youngsters living in Camelot's northernmost suburbs? At the very least: the loss of our hands. We were not impressed by our school insurance forms, which promised us a windfall $500 for each lopped-off extremity. We knew this wouldn't be enough. We knew we had to develop competent back-up systems. The entire neighbourhood could play at being outdoors children, but my sister and I huddled in the dark, practising with our toes for an inevitable physiological Armageddon. Nearly three decades have passed. Neither my sister nor I has yet to lose a body part. I'm beginning to think that footwriting in a darkened room while the rest of the world romps in the sun is some kind of metaphor. Jean-Francois, my footwriting hero, eventually realizes his feet are best used for walking out into the world. My sister and I? We gave up footwriting and went into theatre. My sister found theatre first, but then again she was always a much better footwriter. This play is dedicated to her. 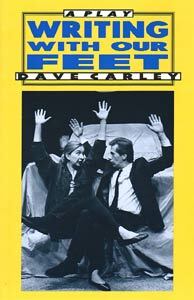 Writing With Our Feet was first produced as a one act play, consisting of about the first twenty minutes of the full-length work, at Alberta Theatre Projects' playRites 90 Festival. (Bob White, artistic director.) It was workshopped by Vancouver's Dark Horse Theatre in 1990 and given a stage reading as part of the New Play Centre's Spring Rites Festival. Robert Garfat directed. Kevin Black and Debra Gordon, from the Carnegie-Mellon Showcase production, Pittsburgh, 1991. Ken Andreyo photographer.